it is famous as it is the place where Gautama Buddha is said to have obtained Enlightenment (Pali: bodhi) under what became known as the Bodhi Tree. 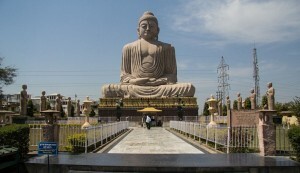 Bodh Gaya is the most holy place for Buddhists. Situated by the bank of river Neranjana the place was then known as Uruwela. King Ashoka was the first to build a temple here. 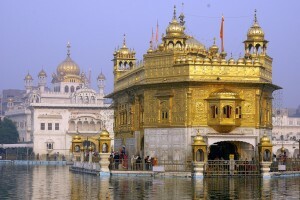 Traditionally, Buddha was born in 563 BC in what is now Nepal on the following auspicious Baisakhi purnima. As Siddhartha, he renounced his family at the age of 29 in 534 BC and travelled and meditated in search of truth. After practicing self-mortification for six years at Urubela (Buddhagaya) in Gaya, he gave up that practice because it did not give him Vimukthi. Then he discovered Noble Eight-fold path without help from anyone and practiced it, then he attained Buddhatva or enlightenment. Enlightenment is a state of being completely free from lust (raga), hatred (dosa) and delusion (moha). By gaining enlightenment, you enter Nibbana, in which the final stage is Parinibbana. Five bombs were detonated in Mahabodhi temple premises on 7 July 2013. 4 bombs were also detonated in town while three were defused.